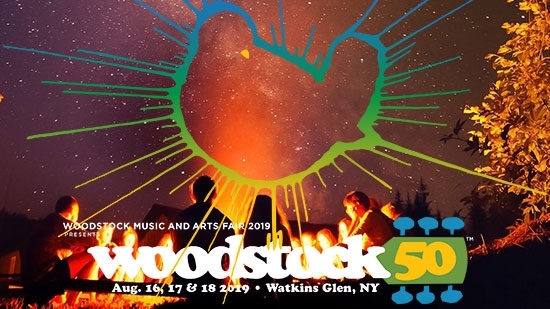 The 50th anniversary of the Woodstock Music and Art Fair will be held this summer in upstate New York. In August 1969, the original Woodstock drew almost a half million people together in a time of political turmoil to enjoy a few days of peace and music. 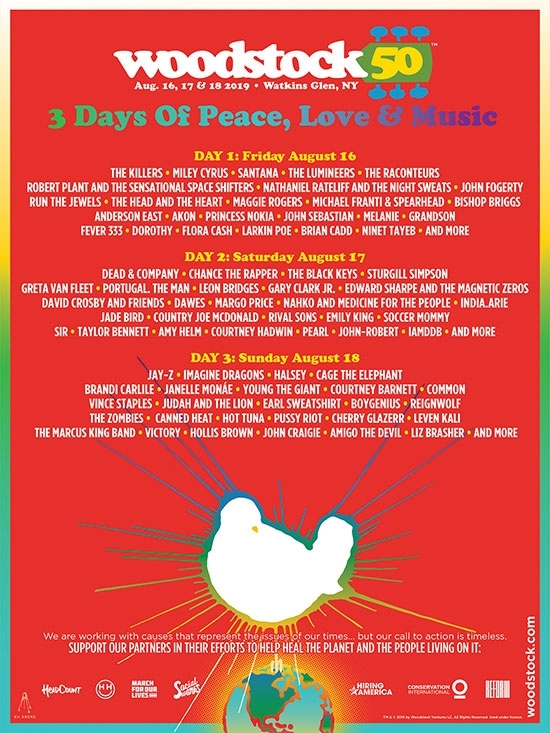 That festival remains the most iconic musical gathering in history with performances by Richie Havens, Santana, Grateful Dead, Credence Clearwater Revival, The Who, Jefferson Airplane, Joe Cocker, Janis Joplin, The Band, Sly & the Family Stone, CSNY, and Jimi Hendrix. "Woodstock 1969 was a reaction by the youth of its time and the conditions we faced," says Woodstock co-founder Michael Lang. "We proved that it is possible to live together in harmony and with compassion... with only our best selves represented. Woodstock gave people around the world hope, which is why I think it remains relevant today." This year's anniversary concert will be held August 16-18 in Watkin's Glen, NY. The lineup has been announced and features a wide range of acts from rock, pop, and hip hop. Headliners include The Killers, Miley Cyrus, Chance the Rapper, The Black Keys, Jay Z, Imagine Dragons, and Halsey. Several acts that played the original fest are also in the lineup including Santana, Dead & Company, John Fogerty, John Sebastian, Country Joe McDonald, David Crosby and Friends, and Canned Heat. Tickets go on sale April 22nd. For more information go to: https://www.woodstock.com.